After nearly destroying half of New York City on his last adventure, the Ministry has suspended Newt Scamander’s international travel permission. They have proposed a compromise to reinstate his ability to leave the country – he must join his brother, Theseus’ (Callum Turner), department at the Ministry. Grindelwald (Johnny Depp) has escaped from his prison transport and is at large in Paris. The Ministry feels that Newt may be of great assistance in recapturing Grindelwald. After refusing to join his brother at the Ministry, Newt is approached by Dumbledore (Jude Law) with a mission of his own. Dumbledore has reason to believe that Grindelwald is after a specific person, Credence Barebone (Ezra Miller). Grindelwald believes Credence is the key to taking over the world from the Non-Majs. 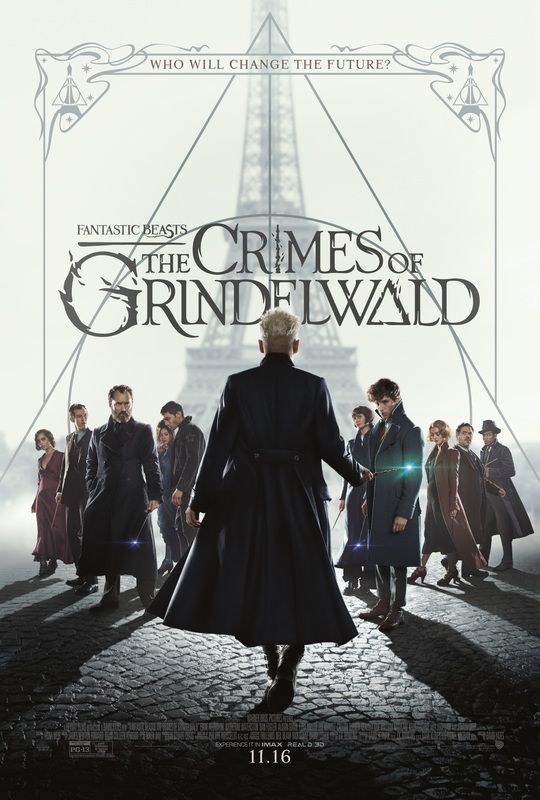 Initially hesitant to cross the Ministry, Newt and his friend Jacob Kowalski (Dan Fogler) travel to Paris to find Credence. Once there, Newt and Jacob begin following the trail of Credence, hoping to find him before Grindelwald does. They are joined by Leta LeStrange (Zoë Kravitz) and Tina Goldstein (Katherine Waterston) who help Newt and Jacob in their quest. If they can’t stop Grindelwald before he finds Credence, the fate of the world is on the line. The second installment of the Fantastic Beasts franchise, The Crimes of Grindelwald tells a meandering story that only minimally advances the narrative. With the likes of Eddie Redmayne, Jude Law, and Zoë Kravitz, among others, the cast pretty much assures you the movie will be good. Don’t get me wrong, the cast does as well as you would expect. The problem is that the material they are working with just isn’t that good. It’s a shame, since the first Fantastic Beasts was a nice bit of nostalgia for those who loved the Harry Potter universe. The script basically wastes the talent of those in the cast. There are no fewer than 18 storylines in this movie. Everything you can imagine is crammed into the movie; from prison breaks, magical animals in need of veterinary care, a love spell, a love triangle, a long-lost love, wizard battles, more magical animals, secret spells, a circus. It gets to be a bit much, leaving you nothing to focus on and making it difficult to follow any one particular story. The only redeeming quality of the film is in its visual effects. We have come a long way since Harry Potter first arrived at Hogwarts, and the effects team make sure they show off just how far we have come. For this reason, and this reason only, I would say see it in a theater if you’re going to see it. To put it bluntly, Fantastic Beasts: The Crimes of Grindelwald is a mess. It doesn’t know what story it wants to tell or how it wants to tell it. It is a very, very long 2 hours 14 minutes that feels at least twice as long. The entire movie is a set up for a major-ish plot point in the last 5 minutes. If you’re invested in Potterverse, you’ll most likely head to the theater to see the next chapter, but it just isn’t worth it.